This will be a ultimate bouncing experience!!!! With this bounce and slide combo you will get hidden experiences of a miniature obstacle course and basketball hoop........ 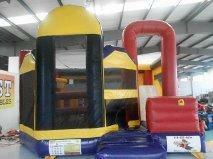 This will be a great addition to any event or party that will entertain all those energetic kids for hours upon hours!!! !